From bumper to bumper, we can fix it all. At Derouin’s Auto Body & Collision, we know that getting your car fixed can be a major inconvenience. We hope to minimize that by handling all your insurance issues and keeping you up to date with the progress of your repairs. Our business is 100% family run. Everyone you will deal with is an owner who understands getting your car back to original condition with as few headaches as possible and a big smile on your face is job one. We hope to do such a good job you feel comfortable about referring us to your friends. At Derouin’s Collision, we are not your stop for a quick oil change or the mechanic you see to fix your windshield wipers. We’re specialists. We help our friends and neighbors get their cars back on the road after an accident, provide auto paint detailing and will help you customize your vehicle with truck and auto accessories. From minor fender benders to major accidents, we provide our customers with affordable auto body and collision repairs. 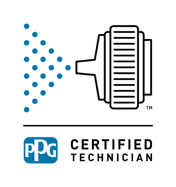 Our ATEG and I-CAR certified mechanics have over 20 years experience. No matter your needs, Derouin’s Collision will get your car, truck, van, SUV, even your motorcycle looking and running great again. At Derouin’s Collision, we have no problems matching your paint color to help you fix a chip or scratch. We can also help with your custom paint design, by providing you with auto paint detailing. We use PPG products to make sure your paint job looks great and lasts longer. We can help you get your car looking better than new by customizing it with truck and auto accessories. Derouin’s Collision can help you find and install anything from running boards and fender flares to vent shades and chrome accessories kits. If we don’t have it in the store, we’ll find what you’re looking for! 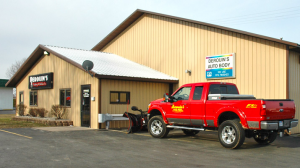 Derouin’s Auto Body and Collision is a family owned and operated auto body repair shop in Escanaba, MI. Since 1991, we have been helping our friends and neighbors with their collision repair needs. At Derouin’s, we believe in treating our customers like family. To us, this means taking care of insurance claims, providing affordable auto body and collision repair, and making sure the car you pick up looks and runs great. You want someone you trust fixing your vehicle. All of our employees have over 20 years of experience fixing cars. With all of that experience, there isn’t a dent or ding we can’t fix. We also pride ourselves on staying up-to-date with the latest auto repair techniques by continuing to take classes. All of our mechanics are ATEG and I-CAR certified. The collision repair process can be intimidating. Get the answers to common questions. Collision repair centers work for you not your insurance. Review your rights. Being in an accident can be stressful. Our guide provides you with helpful reminders and place to record your accident information. Insurance and collision repair terms maybe unfamiliar to you. Find what they mean with this helpful glossary. Schedule an appointment to get your free repair estimate or call us with you collision questions. We look forward to hearing from you! At Derouin’s Auto Body and Collision, we work for you, not your insurance company. Our ATEG and I-CAR certified mechanics make sure your repairs are done right the first time.